Wheat is unique in being the only grain that contains gluten. Gluten is elastic and can hold bubbles of air, when you make bread you are trapping bubbles of air. To do this we need a flour that has a high content of gluten. Gluten is made when protein is mixed with water. To see what gluten looks like take about 20 grams of dough and wash it under a slow running tap. Wash it by squeezing it and the starch will wash away from the dough. After a minute or two you will have a small ball of gluten left which looks like chewing gum. The difference between chewing gum and gluten is that the gluten will try to regain its shape when stretched. This ability means that it can hold bubbles of air. To make air to fill the bubbles in bread we use the starch in the flour. In the fermentation process the starch breaks down into sugar and the yeast feeds on it to create gas. 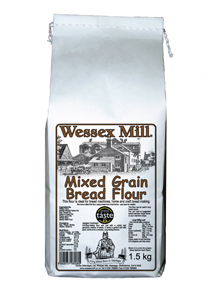 If you grind the flour too lightly, you don't break enough starch granules to give food for the yeast to create gas. You can go too far and over grind the flour which then gives too much starch damage. This then lets the dough ferment too quickly and the dough collapses or goes very slack. 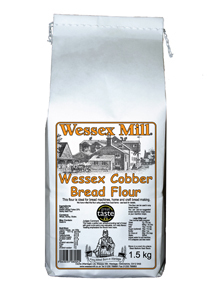 To make consistent quality flour we need to grind the flour to break open the starch granules, and use wheats with a high gluten content. Stone grinding flour doesn't break open enough starch, so loaves are small and have a dense texture. 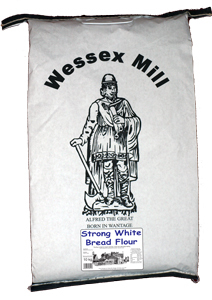 Most stoneground flour is firstly stoneground and then rollerground afterwards. Firstly we clean the wheat, taking out the straw, small seeds like cockle and vetch as well as oats and barley. Then we add water to soften the bran skins. This stops the bran from going to powder when we grind giving better bran flakes. Wheat has an odd shape, it has a crease down the side of it. This means that we can not just polish off the bran, as we would be left with bran in the crease. We split the wheat open using steel rollers that have small teeth in them. You can see the teeth at the top of the picture. This roll is going away to be re-cut. The stamp on the side says it was made on the 24/10/1939. The top roll goes faster than the bottom. The wheat sticks to the bottom roll so that the faster top roll splits it open. After the first grind we have a mixture of bran, semolina and flour. It is then sieved. The bran goes off to be cut again as not all the endosperm has been released. At every grind we create semolina. It is sieved on a machine that has air flowing through it. The small particles of bran float off and the heavy semolina falls through the sieve. 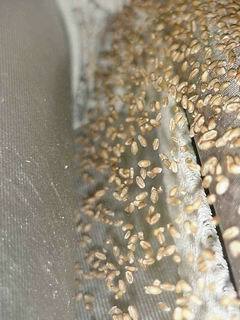 You can see the wheat germ in the picture. This gets flattened by the rolls and can be sieved out at this stage. The semolina then goes to smooth rolls to grind it into flour. Semolina is very hard so we gradually reduce the semolina into flour by grinding and sieving several times. Every time we grind we produce flour. So at any one time we are producing more than 15 streams of flour. They are all mixed in together to make one flour. If we want wholemeal then all the bran and wheatgerm are added back as well. 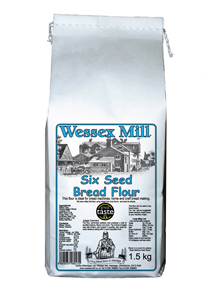 The end result is a consistent quality flour. It can absorb water (slows down the staling of bread) and feed the yeast (to give more lift).